Creative Dies have developed a brand new range of background stamps. We have 5 to GIVEAWAY – scroll through to the end of this post to find the entry form. You’re going to love cardmaking and getting inky with these brand new background stamps designed by our talented Creative Dies designer Kay Whittaker, right here in the UK of course! 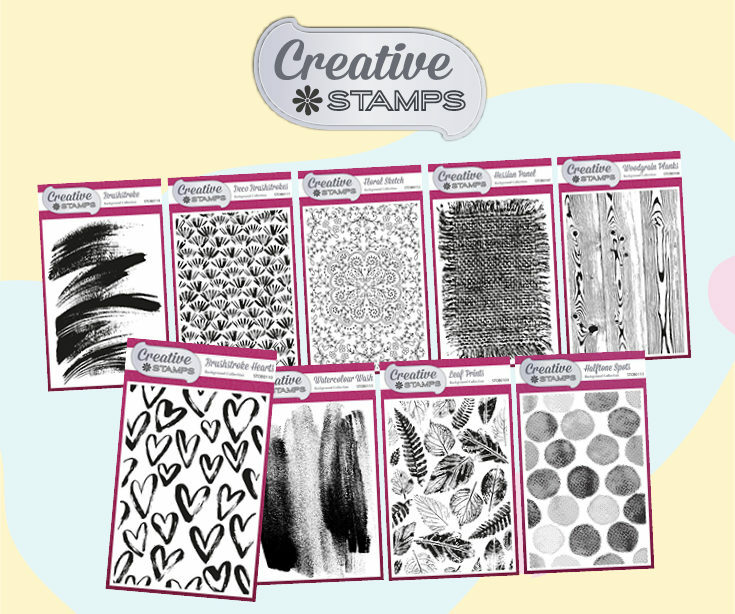 We’ve been getting feedback on exactly what you’re missing from your craft stashes and we think these stamps will offer so many creative opportunities for you all. 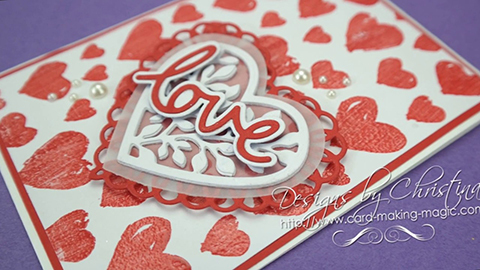 Janette has posted a great new video to demonstrate these lovely new background stamps. Take a quick look now before you enter the competition and win your own to play with! There are 10 stamps in total in this collection, we’ve shared a selection of them below. The full range gives you lots of creative options for your papercraft, cardmaking and scrapbooking. Background Stamp Ideas for you to try! Could be for Valentine’s day but doesn’t this card work well as a get well soon card. The brushstroke hearts can be layered in different colours or keep it really simple, they look like they’re floating up like heart-shaped bubbles – gorgeous cards and gift boxes in an instant. Looks just like a real swatch of hessian, this background will be great for masculine cards or for creating organic and eco-friendly themed cards. The rustic look really works teamed with this pretty flower jewel and ribbon – a great contrast. We also have a wood panel background – just waiting for some pics so we can share that with you too. This leafy background stamp has been used here, not to create a background but individual leaves fussy cut to create this beautiful effect. Now, these leaves could work for Autumnal cards, but if you use fresh greens, they would do perfectly well for spring! Brushstrokes can be used for so many occasions – a great way to quickly fill background space when you have a focus die in mind to use. Most people won’t know you haven’t got your watercolour brush out and painted these on yourself! Spots are always hit for birthday cards and they’re really gender neutral, just pick their favourite colour. This clever stamp uses a different density of dots to create lighter and darker spots instantly – all with the same ink! A pretty watercolour wash makes a perfect background for a multitude of cards and scrapbooking projects, choose delicate pastels for subtle washes or really vamp this up with vibrant hues, like this gorgeous sunset valentines day card. The black sentiment looks really striking against the orange. This card uses a mix of two backgrounds, watercolour is such a great trend we’re seeing at the moment and these stamps make it effortless to achieve. The pattern is inspired by art deco style but created loosely to fit with the contemporary watercolour trend in card making. With this sample card, the background stamp has been used to create foreground – now there’s versatility! The layered hearts really work, the little patches of white create that stylish but naive look, just a few brushstrokes and it’s complete! You’re all going to love playing with these, we can’t wait to see your examples – share them with us on our Facebook wall! If you’re a blogger/youtuber you can also sign up to our affiliate scheme – why not earn a little extra spending money towards your craft supplies! Now here’s how to win 5 to play with!